Use Body & Mind Shop High Strength Serrapeptase 250,000IU and help remove plaque build up from the arteries and improve the circulation. 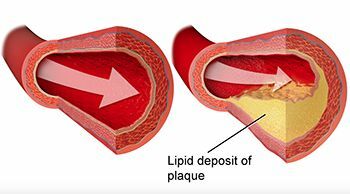 Serrapeptase can help remove plaque build up from the arteries and improve the circulation. Why not? Buy Body & Mind Shop Serrapeptase – 250,000 IU (units) Super strength (90) capsules in a resealable, foil fresh, light proof pouch bag. This packaging provides zipper closure to preserve the shelf life and keep food supplements as fresh as possible. In addition, this packageing, reduces waste and we can offer you a Body & Mind Shop high strength Serrapeptase used by practitioners at the lowest price. 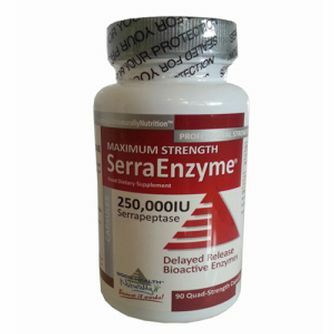 Take advantage of Body & Mind Shop Serrapeptase 250,000IU while stocks last. Non –GMO, PHTHALATE FREE Phthalate free is suitable for vegan and vegetarians. 'Special Offer' £35.95 (90) in Veggie capsule. Why not trial Serrapeptase and experience the power of the Silkworm whose magical substance Serrapeptase can offer you a safe alternative to pain-killers for incredible pain relief for all joint and back pain arthritis and sports injuries. Body & Mind Shop Serrapeptase represents the highest Serrapeptase brand supplement currently on the market, in a Veggie Capsule to support normal cardiovascular and arterial cleansing at a low price. Body & Mind Shop Super Strength 250,000 IU Block Buster gives serrapeptase benefits to healthcare practitioners and patients an alternative drug free pain relief option, without the undesired side effects from pain-killers, which only offer temporary relief in the treatment of inflammatory conditions and restoring respiratory health. Practitioners how to use tips 'by' health practitioners is that it is normal to begin to see benefits within a couple of weeks, but others may need a month or so, depending upon what their specific health issues are. To be fair, give yourself at least two months. To answer another common misunderstanding: Serrapeptase does not thin the blood. It does, however, help prevent blockages forming due to ‘sticky’ blood (which is in fact caused by inflammation). Remember to take Serrapeptase on an empty stomach. This can be 30 minutes before a meal or at least 2 hours following any food. Another Golden Rule or Tip: is to remember to take Serrapeptase with at least a (half pint) or an 8oz glass of water/ juice. Another great advantage with Serrapeptase is that you may continue to take any medication that has been prescribed because Serrapeptase has no drug interaction. Many of our customers usually find that their doctors, reduce the medications that they no longer need once their bodies have adjusted and no longer depend on them. Patients also find out that they can take Serrapeptase regularly without results being diminished or having side effects. Clinical studies suggest that Serrapeptase is perfect for medium to long term gain in maintenance of health and prevention. Serrapeptase taken in either tablets or capsule form are enteric coated and better taken whole. Children (older than one) and patients with severe swallowing issues, tablets can be crushed or capsules can be broken open and mixed with the powder together with a little amount of honey and water. Tip: Technique it has been found to make swallowing easier, by leaning forward as far as you can helps, by opening the throat. Special technique with throat problems can be made easier by chewing tablets or breaking open any capsule and chewing the powder, allowing it slowly to move down the throat. Honey can be added to make swallowing more comfortable. Another question we often come across is can Glucosamine continue to be taken, together with other joint support supplements? The answer is because they perform a different function and will help to boost your results. Body & Mind Shop Super Strength 250,000 IU with its rich Serrapeptase enzymes, can be used with the Bemer signal for scar tissue to (find out more about Bemer Technology see before and after videos on our home page on vascular therapy using Bemer increasing the micro circulation to increase capillary bloodflow. Please contact us with your serrapeptase testimonials and for more information on Bemer health please watch the short video on the home page. 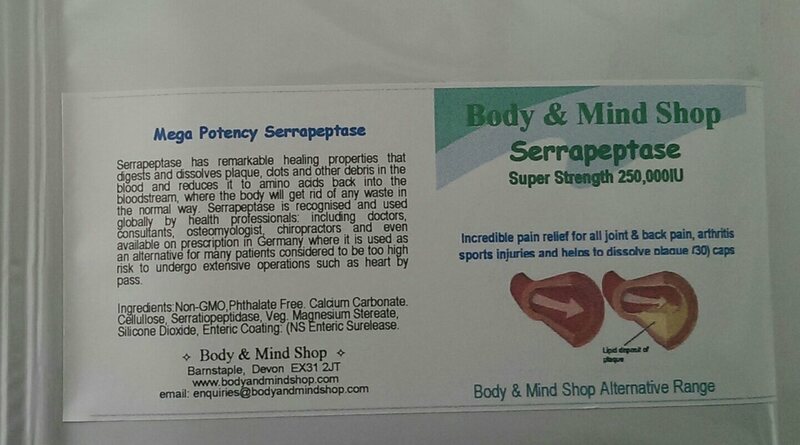 Due to a surge in demand to procure the highest strength, best quality serrapeptase supplement from within the (UK), and to meet with an expanding market oversea's from practitoners wanting to buy from a reputable source Body & Mind Shop supplies health professionals worldwide and here in the (UK) to include medical doctors, consultants, ostemyologists, naturopaths, and chiropractors. In Europe, and in Germany Serrapeptase is available on prescription and has been well established in United States of America for more than 25 years. Unfortunately, this amazing enzyme is still not available on prescription here in the (UK). Body and Mind Shop has procured for the practitioner and patient one of the best quality high strength Serrapeptase, that delivers continuous without diminishing benefits for Lungs, Cells, Brain Health and immune system. Serrapeptase in Germany is used to provide a safe alternative for many patients considered too high risk to undergo extensive operations such as heart bypass. Body & Mind Shop's block busting Serrapeptase 250,000 IU could be considered as part of an alternative solution. Serrapeptase and the magical power the silkworm has the ability to break down dead tissue and inflammation throughout the body, the enzyme can be used to treat a wide range of conditions. Arthritis and Joint and Muscle Pain such as night cramps. Why is Serrapeptase used by health professionals worldwide as a safe non surgical option? Serrapeptase has remarkable healing properties that address the main cause of disease and slowing down of circulation in the body, which are inflamed and dead tissue - a high strength Serrapeptase simple digest them any non living blood clotting and dead tissue, such as blood clotting, cysts arterial plaques, together with this enzymes pain blocking effect from inflamed tissues, that can be used by the body to treat so many conditions not only safely safely with no known side effects and furthermore it will not interfere with any medications, which is impressive and can be taken for children 2 years and over and can be used on animals. So effective on animals that many vets have been prescribing it leading to may owners sharing their supply with their pets. For alternative pain relief. We encourage you to try and reduce your need or dependency for steroids and NSAIDs and other drugs that can only offer temporary relief from pain without helping the underlying condition, which can also have dangerous side effects, that may result in other medications having to be described to treat counter damage. Skin rash, nausea, constipation, blood disorders, ulceration and damage to the lining of the stomach, kidney and liver problems. 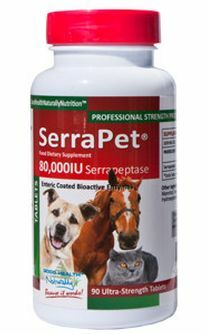 SerraPet Serrapeptase is a nutritional enzyme that is well known for it's positive reactions when in pure quality and high strength as part of your pet's everyday nutriton. then close the muzzle, keeping it closed, followed by stroking the throat until the dog / pet swallows. Tip: on how the vets give Serrapeptase to horses by placing within a small piece of apple or carrot. Please ensure that the Serrapeptase is taken on an empty stomach. It is also recommended that these tablets are NOT chewed or crushed, as they are enterically coated to protect them from being destroyed by stomach acid.